Leeks are relatives of onions, with a milder, more herbal flavor that sweetens as it cooks. Although often considered a root vegetable, leeks do not usually form a bulb. The edible part is the bottom 6 inches or so of the cylindrical stalk, that has been blanched and kept tender. Leeks are most commonly used as an aromatic vegetable in soups and casseroles. Leeks look like 2-dimensional onion plants. The leaves grow opposite each other, and the plant takes on an almost flat appearance until the leaves become long and floppy. Leaves: The tough, flat, bluish-green leaves encircle each other, forming a cylindrical base at one end and a fan of folded leaves at the other. Flowers: Leeks are biennial, growing a flower stalk in their second year. Most leeks are harvested in their first season and will never bloom. Blooming will diminish the eating quality of the leeks and is only encouraged if you are saving seed. 12–30" (h) x 9–12" (w). The edible portion is about 6–10" in length and 1–2" in diameter. Most varieties require a fairly long growing season of 120–150 days, although some modern cultivars have been bred for short seasons of about 90 days. Leeks don't die back and signal they are ready to harvest, the way onions do. They should be ready when the base has at least a 3" white section, and it feels firm and solid. Most varieties are ready to start harvesting when the base reaches a diameter of 1". Harvest by twisting and pulling or digging. Leeks are very frost tolerant and, in mild climates, can be left in the garden throughout the winter. Slugs will munch on tender transplants. Damp weather or wet soil can lead to leaf rot, which shows up as white spots on the tips before the tips eventually wither and die. There is no cure, but providing good air circulation, allowing the soil to dry between waterings and removing any plants that appear to be infected will decrease the likelihood. Leek rust, orange pustules on the leaves, can also affect leaves in damp weather. Remove the affected leaves and improve air circulation. New growth should come in healthy. Remove affected foliage; later maturing foliage will be healthy. Soil: Leeks like a slightly acidic soil pH of about 6.0 to 6.8, although they will tolerate more alkaline soils. 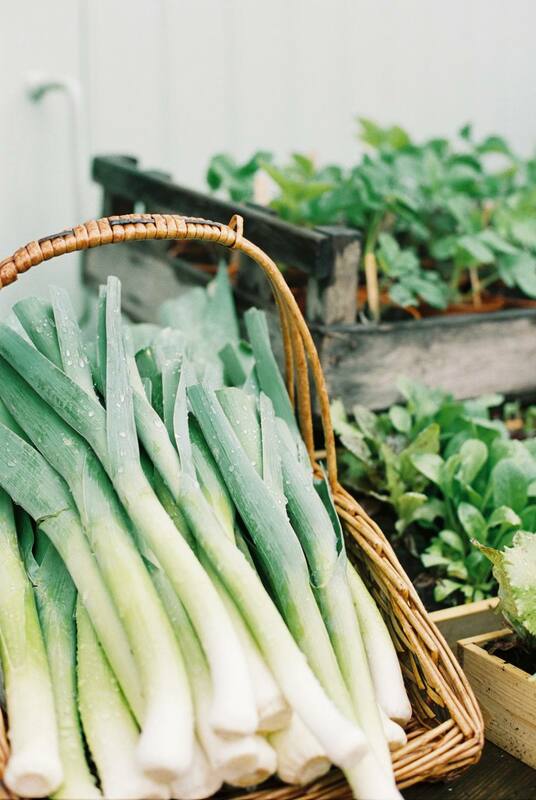 Since you're growing leeks for their leaves, you'll want a rich soil, with lots of organic matter. You may also want to add a balanced fertilizer when transplanting. Planting: You can start leeks from seeds or transplants. In cold climates, seed can be started indoors, 8--12 weeks before your last spring frost. Move outdoors when temperatures begin to stay above 40 degrees F. Harden them off slowly, for about 7 days, before transplanting in the garden. In warmer climates, where spring and fall are your prime growing seasons, you can either start seed indoors, 3–4 weeks before your last spring frost and transplant outdoors for an early summer harvest, or direct seed in late summer and harvest in winter through early spring. You can space the transplants somewhat close together, but allow the leaves room to branch out. The leaves all grow out in the same direction, so if you position them to grow out into the spaces between rows, you can squeeze plants in every 2–6 inches. When you're planting in a furrow: While transplanting, dig a 6" furrow. Place the transplants in the bottom of the furrow and add just enough soil to cover the roots. Continue filling the furrow with soil, as the leeks grow, until the soil line is level with the garden soil. Planting the leeks at soil level and mounding soil or straw at the base of the plants, as they grow. Lean a long board on either side of the plants, creating an inverted "V," when the leeks reach approximately 8" tall. Leeks have a bad reputation for being gritty. Soil can easily become trapped between the leaves, as they grow. To keep them cleaner, you can slip the cardboard tube from paper towels or toilet paper over the young plants. The tube will eventually disintegrate, but it will keep the grit out. Leeks are shallow rooted. Use caution when cultivating near the plants and keep the area weed free. Provide at least 1" of water each week. Mulching will keep the soil cool, retain water and prevent weeds. Leeks are not heavy feeders, but because they have a long season, a mid-season side dressing of composted manure or a high nitrogen fertilizer is beneficial.